So, it’s warm in Texas. OK, more than warm. It’s hot enough to thoroughly wear one out long before the day is done. Regardless, I’m out working in the shop; the RV isn’t going to build itself. 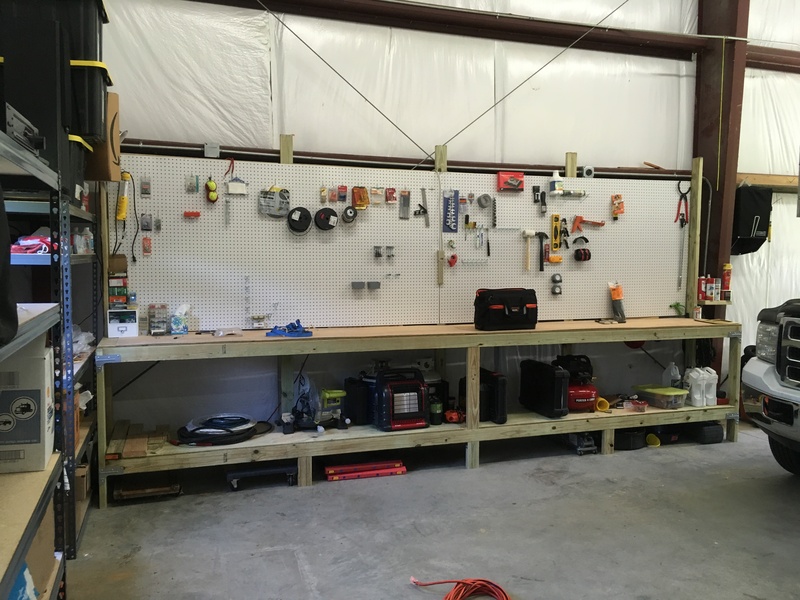 I finished building the workbench the other day. Overall I’m pleased with it, and I’m surprised at how much of it has already been used up with tools. Sure, there’s more space left, but not all that much. I sure am glad I didn’t build it any smaller than 16′. I ended up using just about every last bit of 2×4 I purchased, even after buying 6 extra pieces. The workbench is strong enough for me to walk on it, and it has about 500 screws by the time it’s all said and done. Every time I’d buy a pound of screws I figured that would be enough, but nope, it wasn’t. After the workbench was finished, I took a day off and did basically nothing. Nice to have a break, but being that unproductive bothers me, so the next day (today), I’ve been hard at work on the trailer. 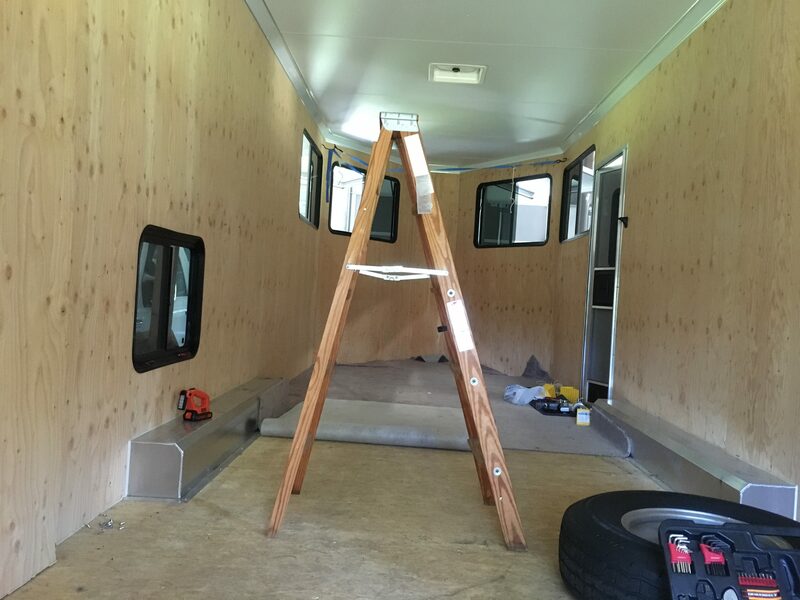 First up on the trailer is to remove the plywood on the walls and determine how much space I have to install insulation. Turns out the pretty trim piece between the walls and the ceiling needed to come off too, which was a bit of chore. Then the walls started coming off. I also found my first disappointment in the construction of the trailer. 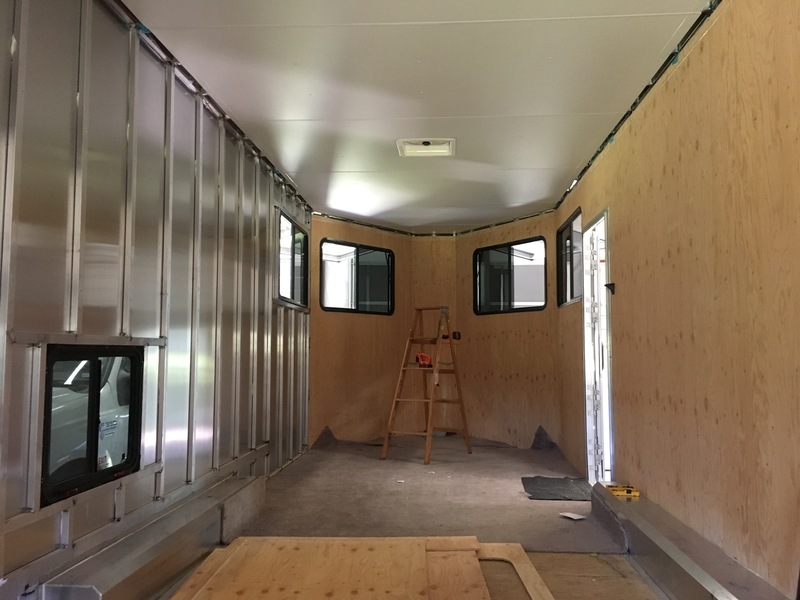 I added some ceiling insulation in the spec build-out of my trailer because it was relatively inexpensive and I’d rather not have to do insulation (and work in general) up there on the ceiling. Turns out they threw 1″ of rigid foam insulation up there and it was basically loose. 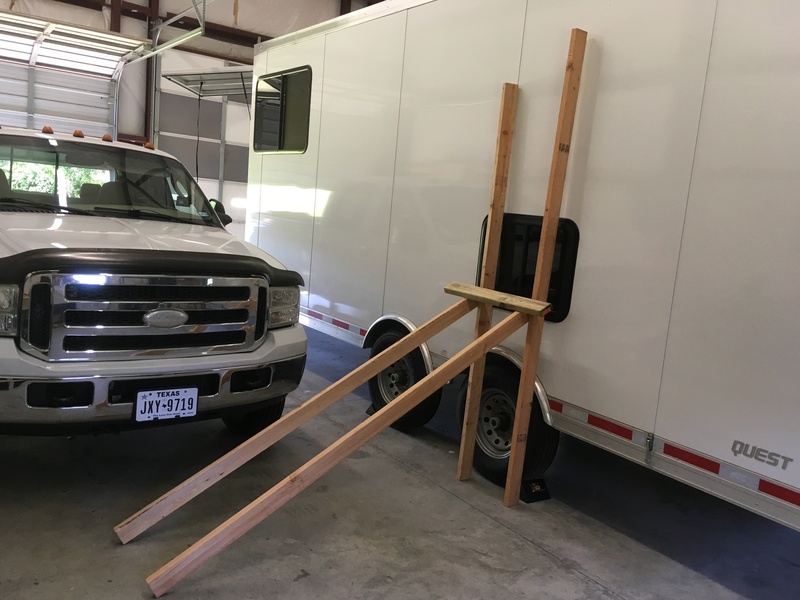 The trailer is 8’6″ wide, and these pieces are about 8′ wide each. So there’s huge gaps on both sides. It also turns out there’s about 3″ of frame up there (as far as I can tell at this point before removing the ceiling), so they could have gone with thicker foam and it wouldn’t have reduced headroom. They didn’t bother mentioning that part. So, I’ll be removing the ceiling paneling and replacing that foam with something much thicker. At one point I needed to remove a piece of trim around one of the windows, and I wasn’t sure if it was a structural piece or not. Given the number of screws in it, it certainly seemed structural. So I built the framing shown above to hold the window in place just in case what I was removing was necessary to keeping the window in. Turns out the window had some other supports in it, so it stayed in place without the framing, but one cannot tell what’s underneath without removing the first layer. Just one of the reasons this project is going to take a solid year (or more): I’m learning everything as I go. The framing in the walls is 1.5″x1″ aluminum square tubing, with the 1.5″ part laying flat against the exterior wall. That gives me 1″ of space that needs to (and will be) filled with with insulation. After that, I’m planning on adding several more inches of insulation to the walls, and I’m just figuring out how I’m going to add some kind of framing/studs into the system so I have something to screw other stuff (like cabinets, electrical outlets, etc.) into. In a stick-frame house, it would be wood, of course. But in this build, I’m shying away from wood as much as possible because wood warps, rots, and isn’t going to hold up as well as other materials. I could use treated wood, like I did on the workbench, but it’s very heavy, and I’d like to avoid that weight if I can. I could use steel or aluminum square tubing, similar to what is currently in the trailer, but it gets expensive quickly (on the order of $50/8′ section for something a couple inches square). So I’m spending a little time today researching options. PS: If there’s any unusual grammatical, spelling, or punctuation errors (or crooked pictures) in this posting, it’s likely due to heat exhaustion. Texas heat just saps the energy out of me. Someday, maybe, it’ll cool off. Nice job on the W.B. Good idea purchasing the wood screws by the pound; cheaper that way. Wall construction, insulation is tricky. I’m going with 2×2 (really 1.5×1.5) for the roof on my teardrop They’re comparatively light yet strong and yield a 1.5 inch depth for anchoring screws Face whatever insulating material foil side out as that will keep heat and cold out I may end up attaching insulation exterior on the wall followed by ‘skin’ thereby circumventing further loss of precious interior room.